BOSTON — Some of the nation’s top middle distance runners assembled at Boston University on Sunday with the same goal in mind: run fast. Most of them will be going home very happy, none more so than the University of Oregon’s Edward Cheserek, who traveled cross-country to break Lawi Lalang’s NCAA mile record of 3:52.88 and did just that, clocking a phenomenal world leader of 3:52.01. NJ*NY Track Club teammates Kyle Merber and Johnny Gregorek also benefited from the fast pace, with both men clocking big PRs of 3:52.22 (Merber) and 3:53.15 (Gregorek). The men’s and women’s 5ks were the other fast races on the day. In the men’s 5k, Bowerman Track Club’s Mo Ahmed kicked to the win over the final 600 meters to set a Canadian indoor record of 13:04.60 and lead eight men under the World Championship standard of 13:22.60. In the women’s 5k, reigning U.S. champ Molly Huddle took the win in 15:01.64 with training partner Emily Sisson right behind her in a big PR of 15:02.10 (U.S. #5 all-time indoors). Race recaps, interviews and results below. 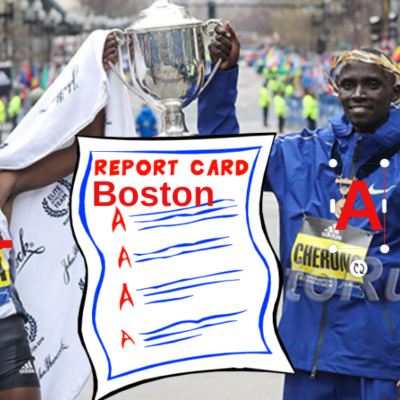 Cheserek came to Boston with the NCAA record in mind, and he made his intentions clear as soon as the gun was fired, sprinting the first turn to settle into second behind pacer Guillaume Adam. 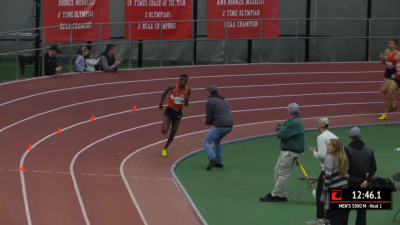 The field quickly strung out single-file as Adam hit 400 in 55.7 with Cheserek right on him. NJ*NY Track Club’s Ford Palmer was the only one bold enough to go with Cheserek early, with a gap behind them to Gregorek and Merber in third and fourth. Those two, in turn, were beginning to open a gap on the rest of the field. As they approached halfway, Merber and Gregorek slowly began to close the gap, and the rabbit’s 800 split was hard to believe: 1:54.7. At that point, it was a four-man race, and the record attempt was well and truly on. The rabbit stepped off at 1000 meters, leaving it to Cheserek to push the pace — an unfamiliar spot for a man who has mastered the art of sitting and kicking. Cheserek slowed a little as they hit 1200 in 2:54.4, and he hit the bell at around 3:24.5 with the order the same, needing a 28-flat final 200 for the record. Cheserek shifted gears as he flew around the first turn and his lead began to open up. Merber responded with his own move once he hit the backstretch but had to maneuver around Gregorek and Palmer, costing precious fractions. 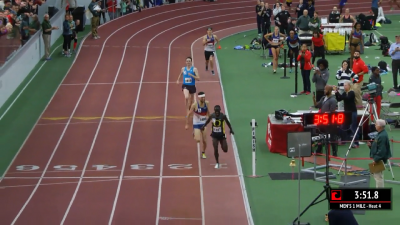 By the top of the home stretch he was right behind Cheserek, but as he swung wide Cheserek had one last gear, just enough to hold the Columbia grad off at the line, 3:52.01 to 3:52.22. Behind them, everyone benefited from the fast pace as 11 of the 12 runners broke 4:00. The record clearly meant a lot to Cheserek, who celebrated more than usual by bowing for the fans on the first turn after crossing the line. It’s hard to believe that after 13 NCAA titles, Cheserek owned zero collegiate records until today. But during his three-plus years at Oregon, Cheserek has always put team goals ahead of individual honors, and as a result did not have many opportunities to chase times. The stars aligned today, however, as Cheserek already had NCAA qualifiers in the 3k and 5k and Oregon’s DMR had qualified as well. 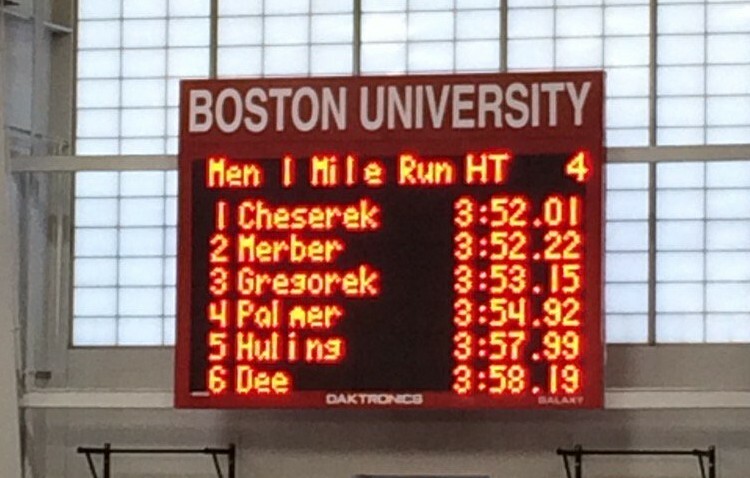 With two weeks until NCAAs, Cheserek had time to run hard and recover, so he flew to Boston and was delighted to break Lalang’s record. “It’s really amazing to just come here and hit the time I wanted to hit,” Cheserek said. Cheserek knew that he was fit enough to break the record if he followed the rabbit and hit his splits, and though he was a little behind what he wanted at 1k, he ran a terrific final 200 to get the record. As for what events Cheserek will run in two weeks at NCAAs, that is up in the air. UO distance coach Andy Powell said he will have to look at who’s qualified and then sit down and talk with head coach Robert Johnson about how best to deploy their resources. 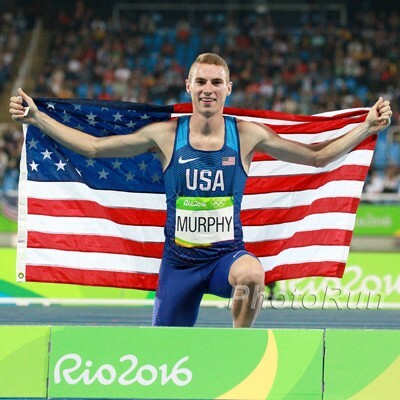 I asked him whether he’d be willing to enter Cheserek in three events, as he did last year. Oregon has won the last two DMRs at NCAAs, and the Ducks are qualified again in 2017. We will see. There was only one negative to Cheserek’s race today for the Ducks: it went so fast that two guys (Iona’s Liam Dee and Middle Tennessee’s Sampson Laari) bumped Oregon’s Tim Gorman down to 19th on the descending order list in the mile (technically Cheserek also bumped him down but Oregon can scratch Cheserek if needed). Only the top 16 declared runners make it to NCAAs. 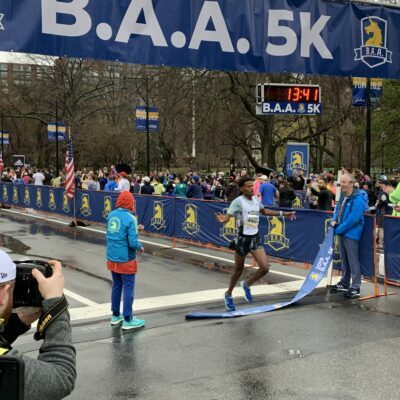 Both men knew workouts had been going well and they ran smartly, giving Cheserek and the rabbit a cushion early before moving up during the middle of the race. Merber was extremely pleased with the time, though said he regretted not moving a little sooner. Unlike the Wanamaker Mile, where Merber seized the lead at the bell but was overhauled late by Eric Jenkins, he waited until the backstretch of the bell lap to move today. He closed extremely well, but ran out of real estate in the home straight. Merber, who was ninth at the Olympic Trials last year despite missing a chunk of the spring due to injury, said he isn’t worried about being too fit too soon. He’s simply been healthy since last fall and has taken advantage. Merber will run the mile next week at USA Indoors. Gregorek wasn’t sure immediately after the race whether he had hit the IAAF World Championships standard, but both he and Merber got it (3:53.40). That’s definitely big: recall that last year, only five men entered the 1500 at the Trials with the Olympic standard. 2017 is slightly different because athletes can chase the standard after the Trials, but not having to worry about chasing a time makes planning the outdoor season much easier. As fast as Gregorek ran today, he still doesn’t hold the family mile record. That would belong to his father, John, who ran 3:51.34 (outdoors) in 1982. This was a race to hit the World Championship standard of 13:22.60, pure and simple, and for most of the race there was very little change in the order of the field. Bowerman TC teammates Dan Huling and Evan Jager split pacing duties, Huling covering the first 2k and Jager the next 2k, with the field going 4:15/8:30 for the first 3200. When Jager stepped off with 1k to go, seven men remained: Ryan Hill, Ben True, Mo Ahmed, Eric Jenkins, Lopez Lomong, Woody Kincaid, Chris Derrick and Kemoy Campbell. Derrick and Campbell quickly fell off, and the first major move came with 700 to go when Ahmed went to the front. The race was on, and within 100 meters, he, Hill, Jenkins and True had separated. Ahmed dropped a 29 over the next lap to open up a five-meter gap on Hill and continued to press his advantage. By the bell, his lead had ballooned to 15 meters and despite a huge move on the final lap from Jenkins, no one was catching the lanky Canadian today. In the end, though, 80% of the field got what they came for: the World Champs standard. Ahmed also got the Canadian record, obliterating Cam Levins‘ 13:19.16 from 2014. Ahmed has always been a super talent dating back to his days at Wisconsin, but until two years ago, he was better known as a 10k man. Now, with Canadian records indoors and out and a 4th-place finish at the Olympics last summer, the 5k looks like his best event, and he showed it again today by blasting a very strong field over the final four laps. Unofficial closing splits for @Moh_Speed: 27.3, 56.1, 1:55.6, 2:58.6, 4:01.5. Ahmed said that his focus on the 5k the last two years has almost come by chance. He missed the 10k World Champs standard by one second in 2015, leading him to run the 5k at Worlds that year, where he placed 12th in the final. 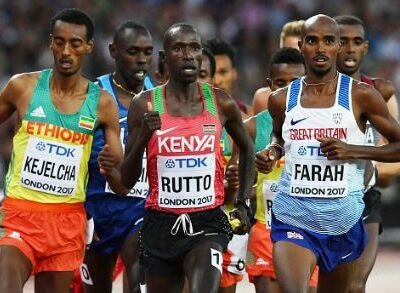 The next year, Ahmed ran a tactically poor race in the 10k final in Rio, only to bounce back a week later and just miss a medal in the 5k. As for tonight, Ahmed wasn’t planning on making a power move when he took the lead, instead intending to simply help teammate Hill with the pace. But he got a gap anyway and kept going to run the fastest time indoors since 2014. Jenkins ran a nice overall PR today of 13:05.85 (old indoor pb: 13:31.76; outdoor pb: 13:07.33) and was pleased with the time. Jenkins said that if he was feeling “ballsy,” he might have gone with Ahmed when he moved, but there was still three and a half laps to go at that point and he elected to wait. Still, Jenkins was pleased with how he closed over the final 200 (he looked to be 27-flat or faster) and ends his indoor season with a Wanamaker Mile victory and a 5k PR. Not too shabby. I wondered if Jenkins would consider moving down to the 1500 given his devastating kick and recent mile success (Wanamaker and the 2016 Fifth Avenue Mile). He said it’s something he’d consider, but most of the guys in the 1500 have much better 800 speed than he does, so he’d have to improve in that area before moving down. I asked Jenkins about the Sunday Times’ latest report on his coach, Alberto Salazar. Jenkins joined the group in the summer of 2015, shortly after the ProPublica/BBC investigation was published, and he said that he’s never seen anything that would cause him to question Salazar. I asked whether a story like the one that came out on Sunday made Jenkins reconsider his decision to join the group. True has made his distaste for indoor track well-known, and despite two terrific races this year (his 8:11 two-mile win at Millrose and a 13:06 today), he probably won’t run another indoor race again. True initially decided to run this indoor season — his first since 2010 — to work on his tactics, but he feels that indoors and outdoors aren’t similar enough for the benefits to outweigh the risk of injury. This was less of a race and more of a two-person time trial as Huddle and Sisson dropped the field immediately and traded off the lead once the rabbit stepped off at 1200. They hit 1600 in 4:51 and 3200 in 9:41, and the only question was whether they would dip under 15:00. 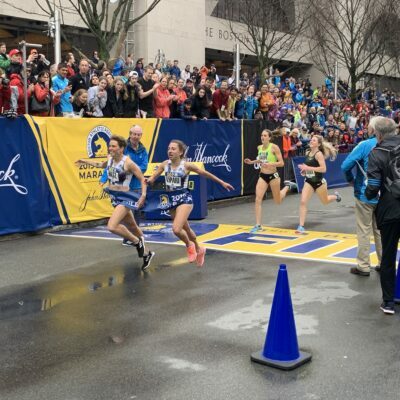 Ultimately, they came just short, Huddle kicking away from Sisson just before the bell to win in 15:01.64 as Sisson crossed just behind in 15:02.10. While the time was four seconds slower than what Huddle ran last year at Millrose (granted, with more competition), it represented a 10-second PR for Sisson, well under the World Champs standard. Huddle said that today’s effort felt harder than she would have liked, but she needed a rustbuster before tackling the NYC Half Marathon on March 19. She said that she definitely felt rusty, even as she kicked away from Sisson over the final 200. “This time of year, I’m generally doing a lot of base, not too much different from my marathon training,” Huddle said. 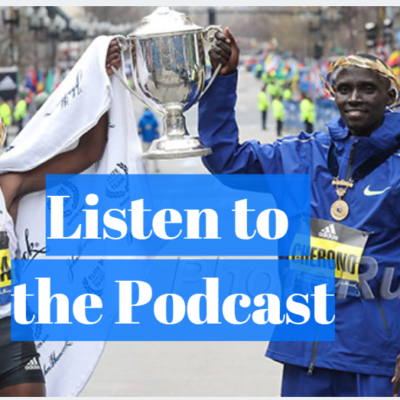 As for her goal in New York, Huddle said she’d love to lower her PR of 67:41, set in New York last year (she’s won the last two editions of the race), but it depends on how the race plays out and the conditions. Looking outdoors, Huddle plans to run the 10k at Worlds and would like to run a couple of Diamond League 5ks in Rome and Monaco and break 14:40. She won’t run another marathon until 2018.